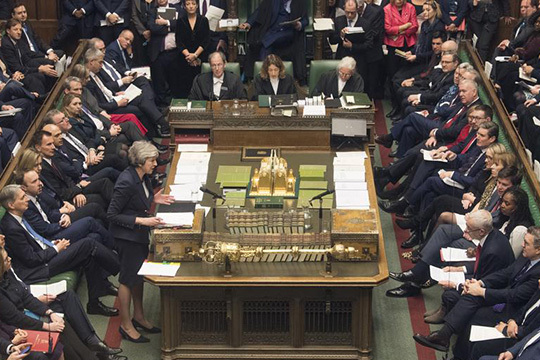 On January 15, the British MPs cast their ballots on the Agreement on the British Withdrawal from the EU, which T. May had reached with Brussels  - “Plan A”. The government lost the vote . On January 29 they voted on the government ‘s "plan B". In fact, the Cabinet did not suggest anything new, having added a number of concessions for EU citizens in Britain, and abolishing the registration fee for them. In turn, the MPs proposed more than a dozen amendments, of which the Speaker of the House of Commons, J. Berkow, selected but a few. If we are to understand the intricate mechanism of British politics, as well as the events to come, we must analyze some. Britain’s exit from the EU, according to the law, is scheduled for March 29, 2019. Significantly, the deputies are divided not only by party affiliation - they create interparty alliances of Brexiteers and Bremainers. Quite frequently they call into question the “party’s general line”, thereby breaking the party discipline. Hence the amendments which reflect acute disagreements in the leading parties whose leaders maneuver between warring factions in their parties. The opposition leader in parliament, J. Corbin, has proposed excluding a “catastrophic” exit of Britain from the EU without an agreement. His plan is to consider an alternative scenario - a permanent Customs Union with the EU and the option of participation in the EU Common Market, as well as to adopt a law on a referendum in which people will vote on a deal or a proposal that will gain the majority in parliament. The main point of the amendment proposed by Conservative D. Greve, the former attorney general, was to put the alternatives to T. May's plan to vote on March 26: the Labors’ plan, a second referendum, an exit “without a deal”, and the “Norwegian version” of relations with the EU. The amendment was supported by some Labor backbenchers and a number of deputies from other opposition parties (Liberal Democrats, the Green Party, Plaid Cymru). Labor MPs from constituencies who voted for Brexit were very dissatisfied about the amendment but it enjoyed the support of those in favor of the second referendum and opponents to exit without a deal (from both parties). However, critics from among the Conservatives argued that the amendment would only postpone the decision indefinitely. In fact, the amendment led to the empowerment of parliament to control the Brexit if the transaction did not take place. Journalists described it as a “legislative torpedo”, which deprives the government of the most important power - to formulate the agenda of parliament. As stated in the House of Commons by T. May, the Greve and Cooper amendments represent a “mechanism for usurping the proper role of the executive branch”, which will lead to “far-reaching long-term consequences for the government of the United Kingdom” . She has a good point here. The opposite point was suggested by the amendment of G. Brady, the head of the 1922 Committee (which brings together Tory backbenchers). As is known, the stumbling block towards the approval of the Agreement with Brussels became so-called “additional guarantees” (backstop) - the provision that the entire territory of the UK will remain in the EU Customs Union until the issue of border regime between Northern Ireland and the Republic of Ireland is settled. It is a kind of “safety valve” against the violation of the 1998 Belfast Agreement on the settlement of the conflict in Ulster between Unionists (Protestants) and Irish Republicans (Catholics). The border should be open, while the exit of Britain from the EU implies its closure (Ireland is a member of the EU, Northern Ireland is part of the United Kingdom). The problem is akin to the quadrature of the circle, so Brexiteers fear that Britain, under the Agreement with the EU, may remain in the EU Customs Union indefinitely long without the right to unilateral exit or the right to conclude trade agreements with third countries. The latter is one of the most important goals of Brexit. Political maneuvering amidst the Conservatives in relation to the Brady Amendment suggested that, by supporting it, the Brexiteers would gain a few weeks, and will then fail the agreement with the EU again - in February. Thus, the Conservatives are divided on the issue of the degree of intensity of ties with the EU in case of exit, whereas the Labor are split on whether to withdraw from the EU at all. None of the amendments, if successful, obliged the government to anything but would impose political obligations on the Prime Minister. The exception is the amendment of I. Cooper - if approved and followed by the adoption of the relevant law, the government would be obliged to obey the law. VOTING RESULTS: J. Corbin’s amendment rejected (327: 296), Greve’s amendment rejected (321: 301), Cooper’s amendment not adopted (321: 298), since several Labor voted against their party’s policy and the pound sterling rate dropped, the Spelman-Dromy Amendment accepted (318: 310), the Brady Amendment adopted (317: 301) . Thus, the chaos in parliament has manifested itself: the deputies voted for two mutually exclusive amendments - against exit without a deal and for adjusting the Agreement (which the EU refuses to do), thereby paving the way for exiting without a deal (exit without a deal is impossible, but the deal is impossible to accept while changing it is not what Brussels is willing to do). The European Commission Chairman stated: “The agreement is not subject to revision. It seems that some expect the remaining 27 member states to give up on the “additional guarantees” and on Ireland, but this is not a game, but the core of EU membership. The border of Ireland is the border of Europe - that is the priority of our union ”. However, this "Plan B" (which served the interests of a fragile peace in the Conservative camp) has already been described by Brussels as a trick. It appears that J. Blackford, the leader of the Scottish nationalists in the House of Commons, has expressed the hidden desire of the Brexiteers: readiness to sacrifice Northern Ireland. The Conservatives "tore to shreds" the Belfast Agreement, rejecting an open border with Ireland . According to the Guardian: “A fairly dubious type of a compromise plan that does not offer a compromise ... The new Malthouse Doctrine actually has the same misconceptions of hardline Brexteers, but in disguise. The Prime Minister proposes that the backbenchers vote against their agreements with Brussels so that she could return to Brussels to ask what she knows she will be denied . T. May, having voted for the Brady Amendment, has de facto spoken out against her own brainchild in order to stay balancing on the edge of confrontation between the two factions in her party and not hold early elections. The Conservatives do not want to allow for even a fraction of a chance for a victory of Labor, led by ultra-leftist J. Corbin, although the leading opposition party in the country is also split. Against the backdrop of political battles, businesses have expressed extreme frustration over the continuing uncertainty . Voters are furious over the work of the deputies: according to a survey , the percentage of voters who have voiced their outcry in connection with the situation exceeds 70%, regardless of what they think about Brexit, or their place of residence (city, village). Agreement on the withdrawal of the United Kingdom of Great Britain and Northern Ireland from the European Union and the European Atomic Energy Community, as endorsed by leaders at a special meeting of the European Council on 25 November 2018. Withdrawal Agreement and Political Declaration. 815: 30 seconds to mars. Will the Malthouse compromise work?7 February 2019: Will the Malthouse compromise work?! лучшие комедии. Will the Malthouse compromise work?.